While it’s a debated topic in the world of wine, decanters are said to serve two purposes, the first being to separate any sediments that have formed over time or were missed during the filtration process of the wine making. 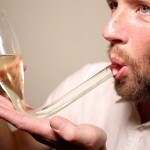 The second function is to aerate the wine, or let the wine breathe. The oxidization that occurs when the wine is allowed to breathe is said to release more aromatic compounds and give the wine a better taste. 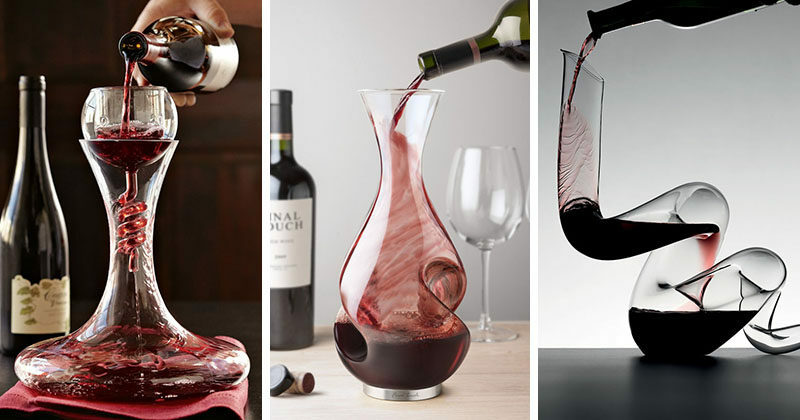 Here are 10 modern decanters that certainly improve the look of your wine. 1. The bottom of this wine decanter has a point on it that prevents it from being able to sit on the table unless it’s perched on its brass base. 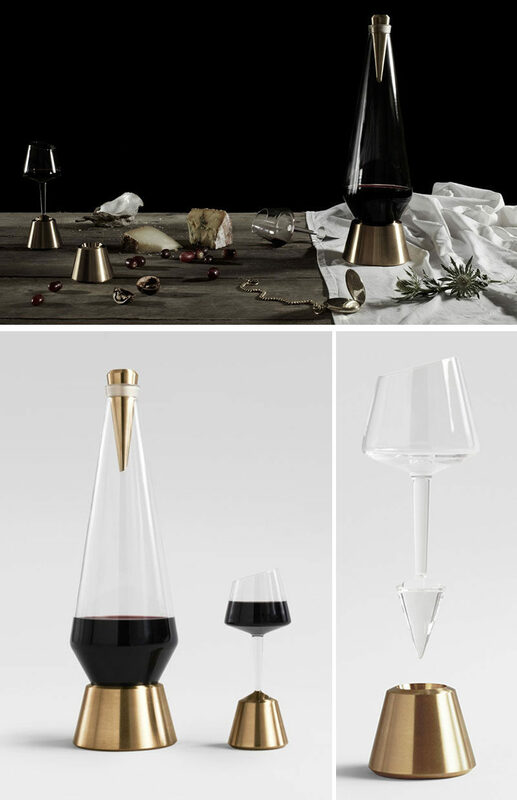 This design is intended to keep people passing the decanter around the table until the contents are gone and was inspired by the Bishop of Norwich who was notorious for forgetting to pass the port. 2. 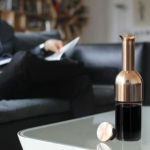 Pour your bottle of wine into this glass and brass decanter that features a filter for catching sediments and a wood base to catch any drips. Decanter from RBT. 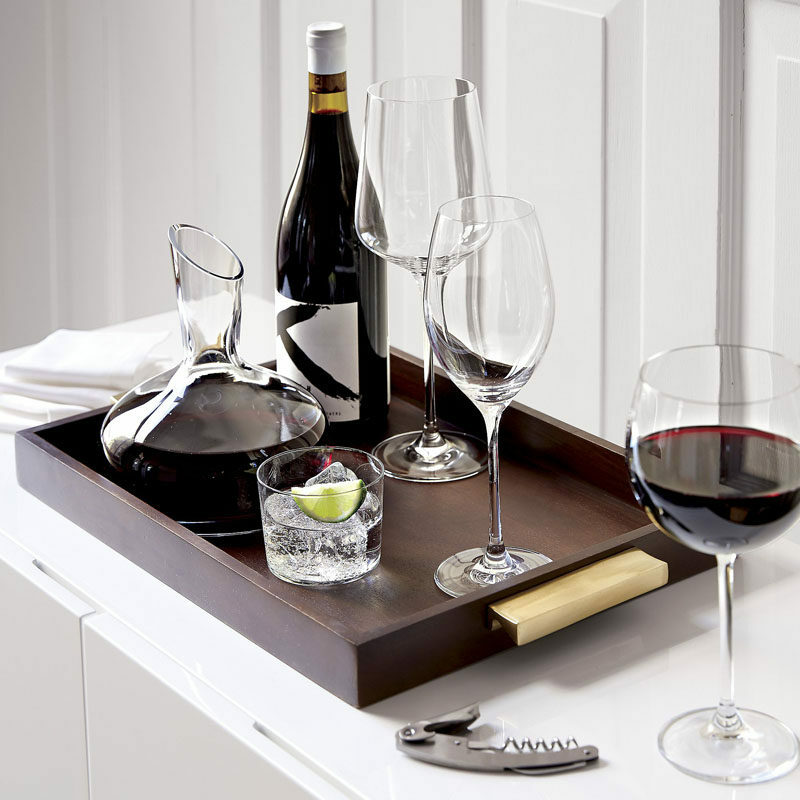 Available at Crate&Barrel. 3. 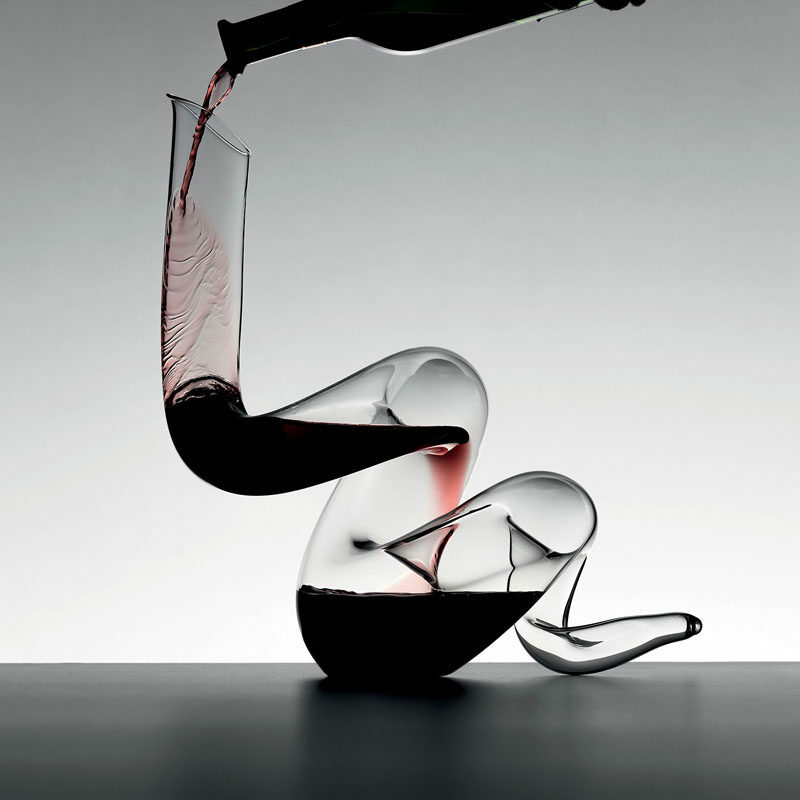 Keep your bottle of wine looking fine in this beautiful curved glass decanter. 4. 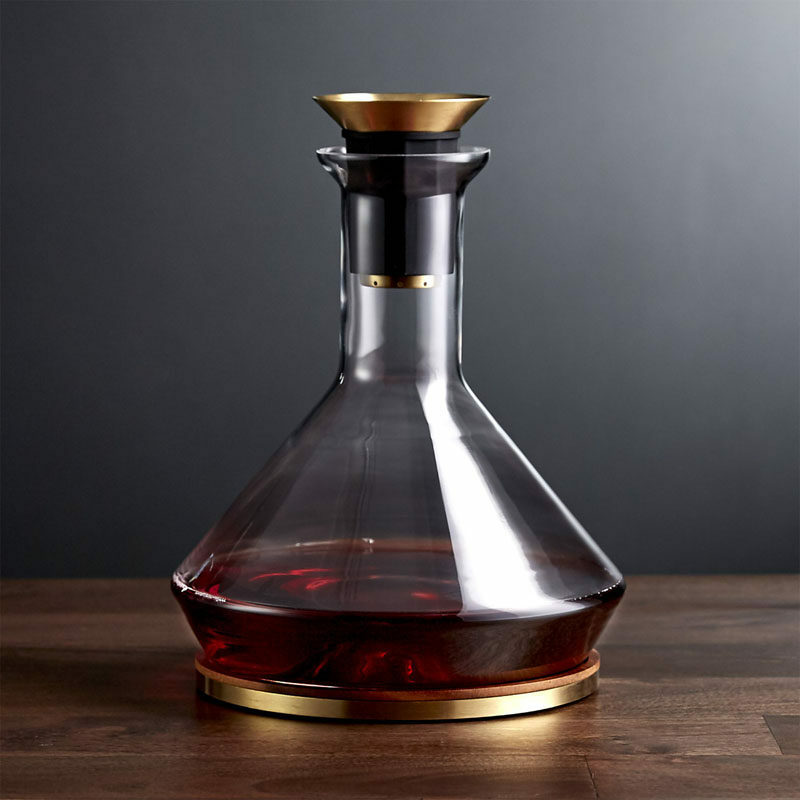 A number of small holes in the side of this decanter creates a unique pouring experience and helps to aerate the wine even more when it’s being poured. See more photos of this decanter, here. 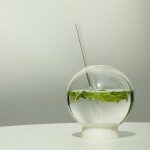 Rainman Decanter by Matilda Sundén Ringnér for Skrufsglasbruk. 5. This fine crystal decanter is both functional and sculptural and would make a gorgeous art piece when not filled with wine. 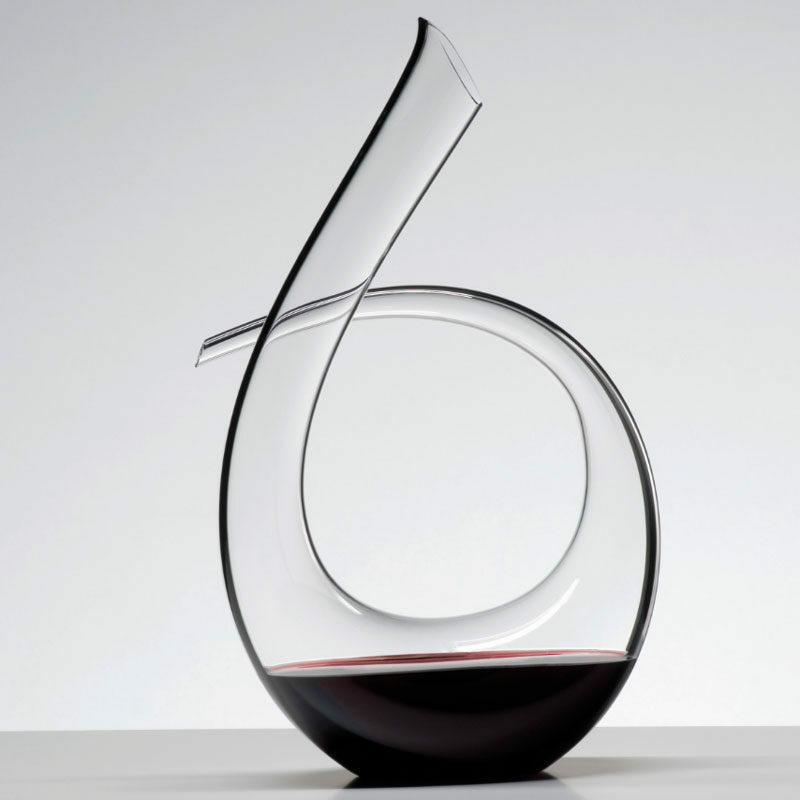 Boa Wine Decanter by Riedel. 6. 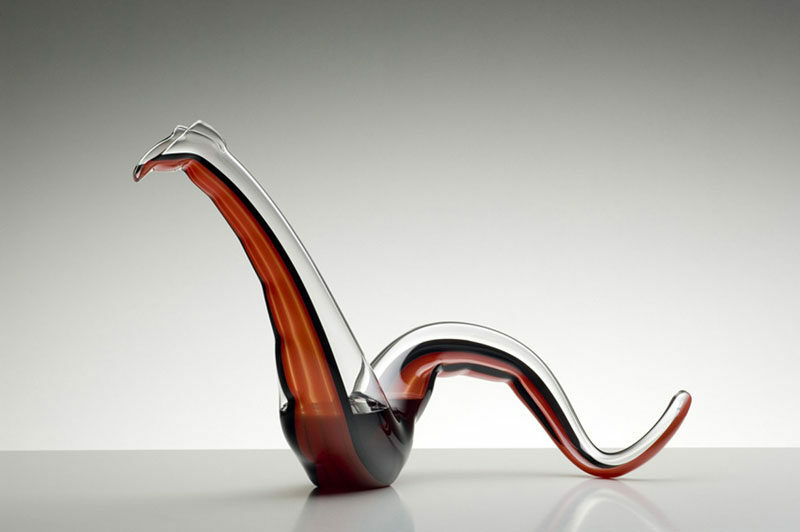 A red stripe runs down the center of this crystal decanter emphasizing its serpent-like form. 7. 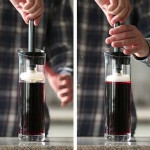 The spiral funnel of this aerator/decanter combo adds more oxygen to the wine as it flows into the wide base of the decanter. 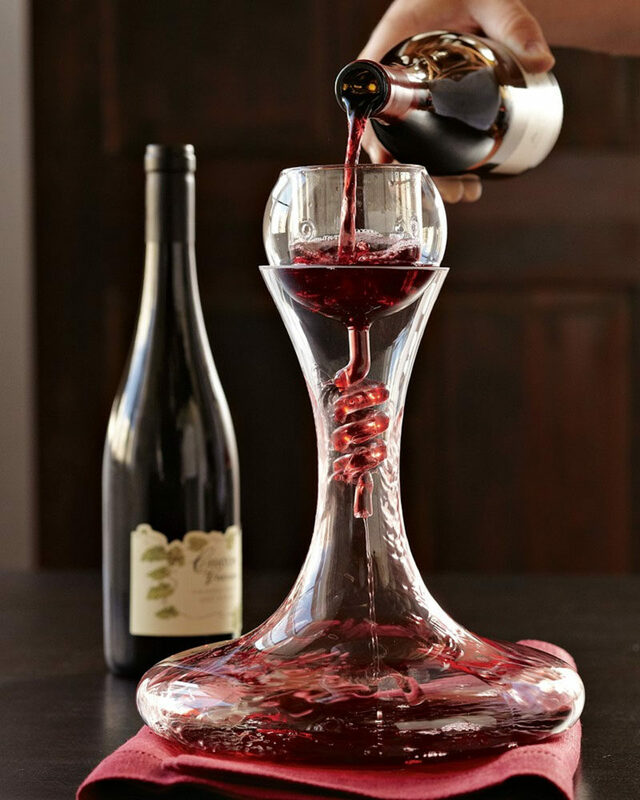 Twister Wine Aerator & Decanter with Stand Set from Williams-Sonoma. 8. 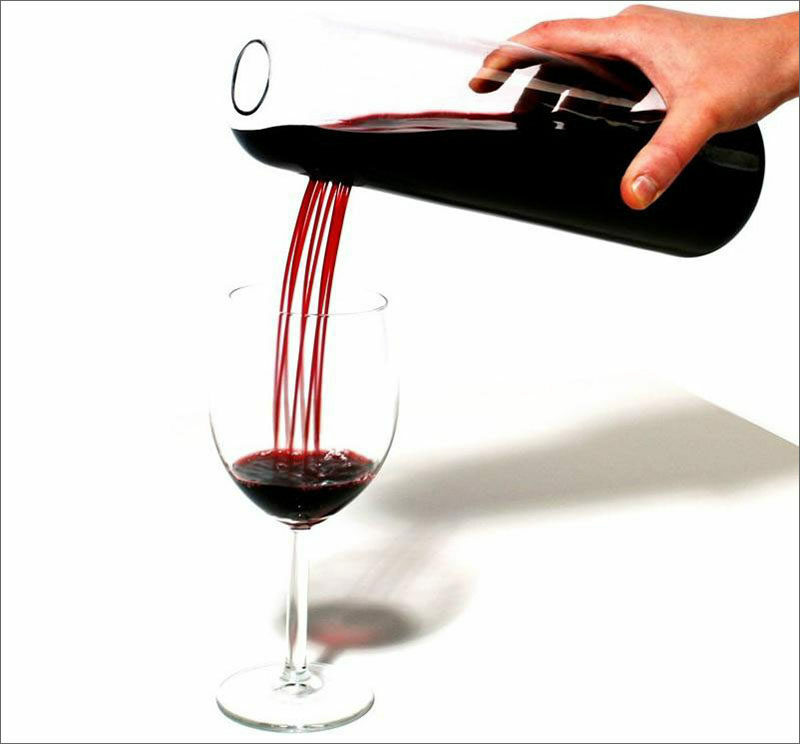 This simple decanter is just the right size for a small gathering of those who prefer their wine on the slightly more oxidized side. 9. 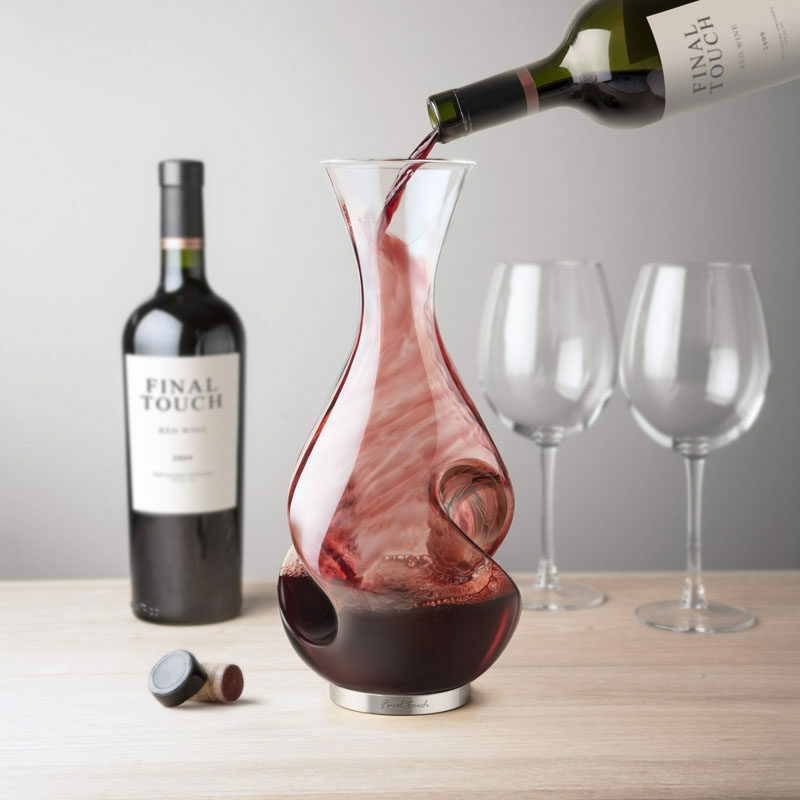 The curves on the sides of this decanter naturally swirl the wine around as it flows down the sides, helping to aerate and oxygenate the wine. 10. 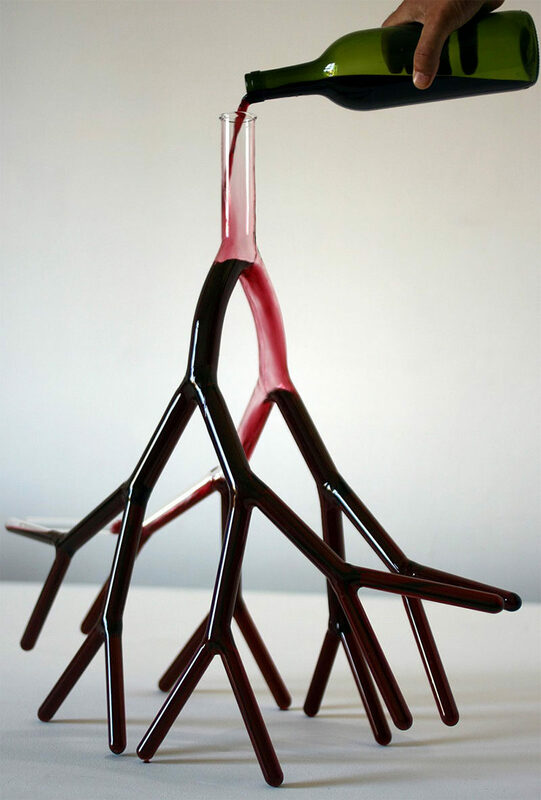 This hand blown glass wine decanter was designed to resemble the look of blood vessels and root systems. The unique design perfectly fits a bottle of wine within it.